Out of around 600 papers submitted and presented during the 8th Eastern Asia Society for Transportation Studies (EASTS) International Conference last November 16-19, 2009 in Surabaya, Indonesia, Dr. Alexis M. Fillone's paper entitled, “The Estimated Effect of the Proposed Fx Megataxi Express Service on Mode-Changing Behavior in Metro Manila”, earned the Best Paper Award for enlightening Asia-specific topics. A total of 10 best papers were given during the conference. Dr. Fillone is the first Filipino researcher in transportation to receive the award in this prestigious conference. The 8th EASTS International Conference was attended by more than a thousand faculty, students and researchers from 26 countries. 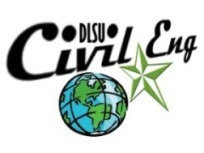 Papers by Dr. Edgar Dona (Civil Eng. Dept), entitled “Airport Location and the Intensity of Urban Concentration” and Dr. Cristela G. Dakila (Economics Dept), entitled “Assessment of Two Modes of Financing Land Transport Infrastructure Investment in the Philippines” and “Core Periphery Relations and Urban Transport Infrastructure Investment”, were also presented during the Conference. Several papers were also presented by the faculty and graduate students from University of the Philippines-Diliman and Ateneo de Manila University. 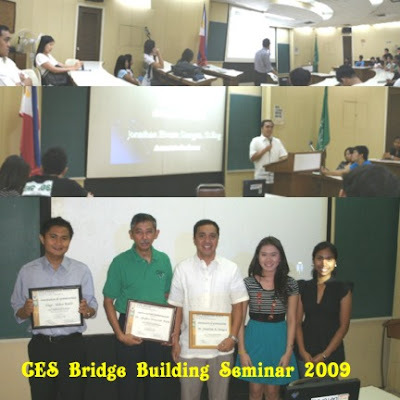 The 6th Annual CES Bridge Building Competition was launched on November 21, 2009 with a Bridge Seminar held at the Tereso Lara Seminar Room. 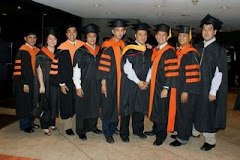 The resource speakers were Engr. Alden Paul Balili who presented Bridge Modeling Concepts and Dr. Jonathan Dungca who discussed about the history and important aspects related to bridge design. Dr. Andy Oreta, on the otherhand, presented the Technical Guidelines of the CES Popsicle Stick Bridge Building Competition. Linette Cornejo presented the General Rules. The seminar was coordinated by CES officers - Kat Llamado and Linette Cornejo. 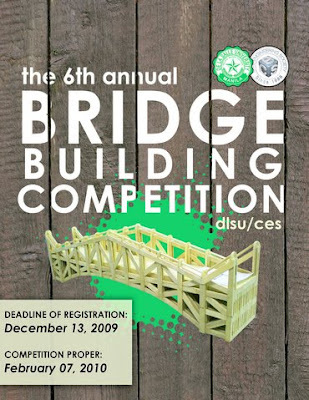 The CES Bridge Building Competition is now open to all undergraduate CE students from any CE school. 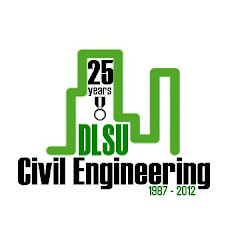 The deadline of the entry is on February 13, 2010. For more details, join the yahoo group: http://groups.yahoo.com/group/bridgebuilding10. To view the CES Bridge Building Competition last year, read the blogs at http://digitalstructures.blogpspot.com/. Contact: Linette Cornejo - 09064202135 or Katrina Llamado - 09062883833. Big prizes await the winners -P10,000 for the top prize for the Strength Category and P5,000 for the Best Bridge Design. Happy Bridge Building!